It’s June and deck season is upon us. Our Omaha deck builders are out across the Omaha-metro enhancing homes and family time with new custom decks. When it comes to planning a custom deck, choosing an experienced Omaha deck building company like Decks, Decks and More Decks ensures you use reliable material, receive creditable advice and see quality craftsmanship. At one time, most decks were built with high maintenance cedar wood; but newer technology provides Omaha home owners with low-maintenance decking materials that’s safe, durable and beautiful. Custom deck colors are not bound by stain colors, but offer countless textures and colors – due to TimberTech and Trex numerous wood-alternative options. A custom deck is not only unique by its color and texture, but also by its pattern. Our Omaha deck experts can plan and build a deck that fits your home and provides unique beauty in its design. These patterns can be difficult to plan for a DIY deck builder, but our deck builders have the technology and skill to provide a unique deck. Call Decks, Decks and More Decks today and make sure you don’t miss out on this summer’s deck season. 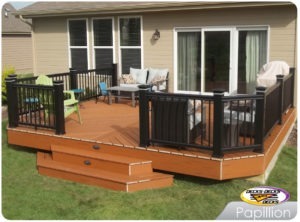 Our Omaha deck experts can plan and build the deck of your dreams. This entry was posted in Custom Decks Omaha and tagged custom decks omaha, deck building omaha, decks omaha on June 30, 2016 by Decks, Decks and More Decks.